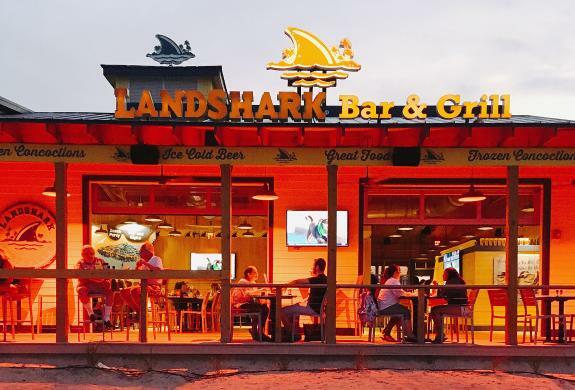 In early 2018, the LandShark Bar & Grill opened on A1A (Atlantic Avenue) in Daytona Beach, Florida, and is a Jimmy Buffett-themed restaurant from the Margaritaville chain of restaurants, resorts, hotels and casinos. This is an incredible location that sits right on the beach overlooking the Atlantic Ocean, and you can actually hear the waves and smell the salt air! I found everything in and around this restaurant to be accessible for me. There is valet parking if you want, and there are several handicap parking spots directly in front of the building. In addition to the main building where the restaurant is, you&apos;ll find a roomy Tiki bar on the north side of the building. There are ramps leading from the parking lot to the front door and to the Tiki bar, and ramps between the building to the Tiki bar. In other words, it&apos;s all accessible. Between the restaurant and the seawall, there is a large grassed-in area where people can play &apos;corn hole&apos; (beanbag version of horseshoes) or just sit among the beautiful palm trees scattered around the grass. Between the five of us, we ordered a Sriracha Burger, a Mushroom and Swiss Burger, a Shrimp Po Boy, a Fried Shrimp Basket, and I ordered the Foot-Long Fish Sandwich. The burgers are double stacked, and my friends said they were really good. I tasted the fried shrimp, and they were fresh-tasting and delicious. Finally, the lattice potato chips along with the french fries were both tasty sides. We enjoyed the live music while we ate. The guitar-playing duo sang familiar songs and the volume wasn’t too loud. There is a pretty good-sized bar in the restaurant with one side opening up to the outdoor porch, and a shaded porch that wraps around the east side between the building and the grassy area facing the beach. It&apos;s a nice, shady area to sit and view the ocean. 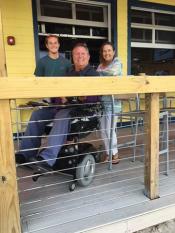 The LandShark Bar & Grill Daytona Beach has the food, the view, and the ease of access you&apos;re looking for in Daytona Beach.